Sellics Home » Sellics Blog: Amazon Strategy Tips & Knowledge You Need to Succeed » What is a good ACoS for my Amazon PPC Campaign? If a campaign has generated $254 in sales with an expenditure of $63 over a certain period of time, then the ACoS = 63 / 254 = 25%. In other words, you’re spending a quarter on ads to make one dollar of sales with that ad campaign. Many sellers use ACoS to determine the success of their ad campaigns. The difficulty in this, however, is defining the right target value for an ACoS – because the ACoS alone doesn’t say anything about how profitable a campaign really is. In order to determine whether a certain ACoS is good or bad, you’ll need to take the entire cost structure of your product into account. As a seller, you won’t incur a loss on sponsored product campaigns as long as you spend less than your profit margin on advertisement. The profit margin is the amount you make after all costs (that is, the cost of production and shipping as well as general costs such as employee salaries, storage costs, etc.) and fees (Amazon fees & possibly FBA fees) are subtracted from the selling price. In the example above, the net profit margin is 22%. As long as you don’t spend more than 22% on ads to promote this product, you won’t lose money. In regard to ACoS, that means that you shouldn’t exceed an ACoS of 22% in order to remain profitable. This is the break-even ACoS. Break-even ACoS isn’t necessarily the number you want to use for orientation as a seller on Amazon, because the goal isn’t to make zero profit with an ad campaign (except if you want to boost your organic rankings by generating as many sales as possible, see more below). You should therefore clearly define which net profit margin you’d like to have after ad spend in order to determine its target ACoS. To make this easier, we’ve made another example below for you below. 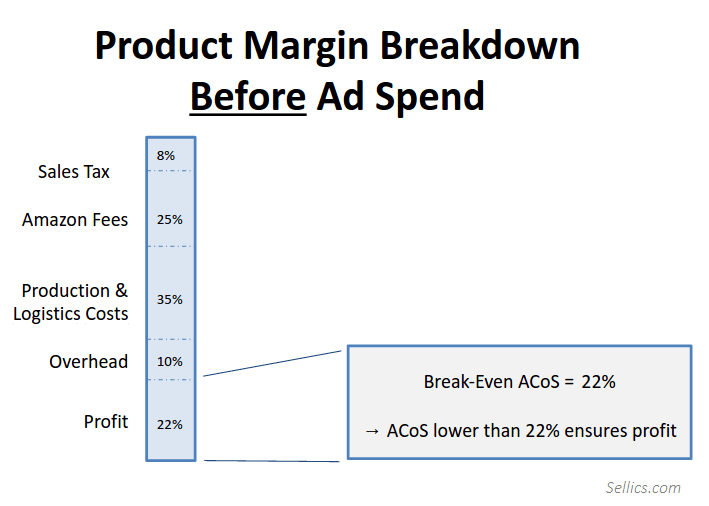 In this example, you have a margin of 22% before subtracting ad spend, so that your break-even ACoS is exactly 22%. 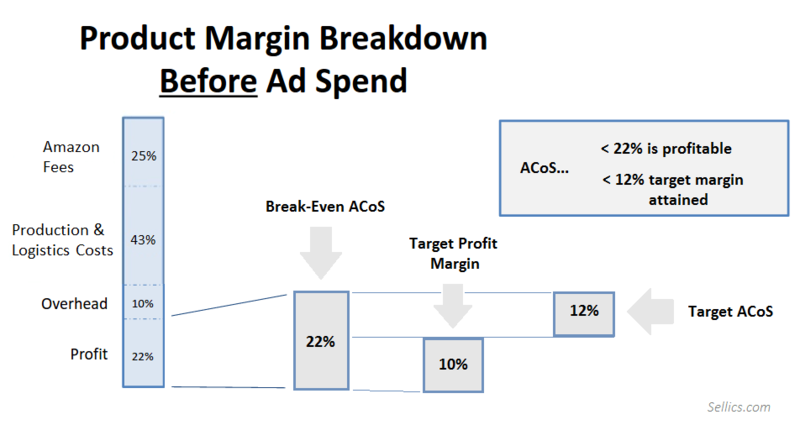 If you’d like to make a profit margin of at least 10% after subtracting advertisement costs, then your campaigns should reach a maximum of 12% for a target ACoS. If you’re able to optimize your campaigns down to a target ACoS of 12% or less, then you’re making the profit margin you’ve targeted. Whether you’re looking to increase sales or lower your ACoS, you can now manage your ad campaigns entirely in our PPC Manager 2.0. Sellics users will no longer need to use Seller Central to manage their Sponsored Product campaigns.